This tutorial will show you how to Learn how to create a simple Html5 website using HTML5 and CSS code from the scratch. Check out the demo and download here! HTML5, the new web standard that has been adopted by Apple, Google and many others, lets web developers create advanced graphics, typography, animations and transitions without relying on third party browser plug-ins (like Flash). HTML5 is completely open and controlled by a standards committee, of which Apple is a member. HTML5 introduces a number of new attributes, input types, new features, easy option and other elements for your markup toolkit. Step 1 : This is the simple design layout that we are going to build using HTML5. * index.html (File) - Here we will build the basic html5 website. * style.css (File) - Where to define styles against any HTML element. 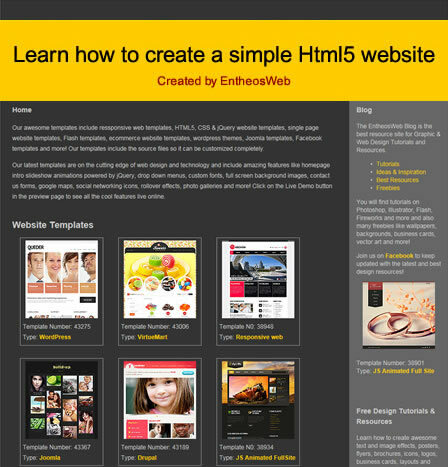 * images (Folder) - Used to store images used in the basic html5 website. Step 3 : Always ensure to start the Html5 website with <!doctype html> before any other HTML code, so that the browser knows what type of document to expect. The doctype for HTML5 is very simple than the previous versions of HTML. The <!DOCTYPE> tag does not have an end tag. * <header></header> (i.e, instead of <div id ="header"></div>) - Specifies a header for a document or section. * <nav></nav> (i.e, instead of <div id ="menu"></div>) - Represents a section of a page that links to other pages or to parts within the page: a section with navigation links. * <article></article> - Used to represent an article that is independent/self-contained content on the site. * <section></section> - Represents a generic section of a document. And also a thematic grouping of content, typically with a heading. It can be nested inside sections, articles, or asides. * <aside></aside> - Represents a section of a page containing not the main content of the page but some content which is indirectly related to the main content. * <hgroup> (i.e, <h1> to <h6>) - Represents the heading of a section, which consists of all the <h1> to <h6> element children of the hgroup element. The element indicate subheadings or subtitles. * <div id="footer"></div> - The ending elements. Step 6 : The image below is the outline of the parts of our HTML webpage. Now define the basic skeleton structure of the HTML webpage using the new structural elements specified in Step 5. Here is a simple example of some code that uses these elements. The <body> tag includes all the main page's structure. 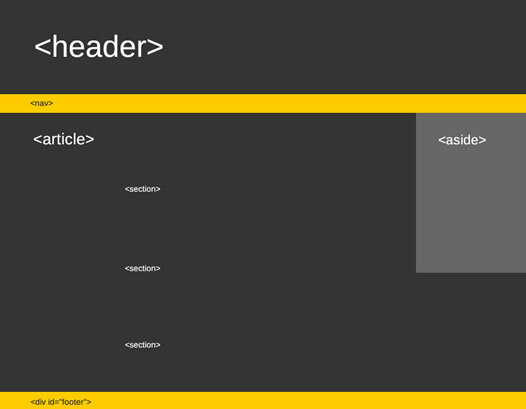 Step 7 : Have a rough structure of all the element in the html layout, so that it will be easy to code the css. We need to start with the basic page structure. In this case we will use some dummy content to create the two column website. Step 9 : Let's first start styling for the page element wrapper, header and navigation in the division. Then for the main content section with a featured article with sections, a sidebar and finally a footer. Step 10 : CSS rules are coded and stored in an external file, named "style.css" separetely. And also linked to the style inside the head tag to reuse the CSS code on many pages. Step 11 : The wrapper is holding the page togather. Hence we can wrap and restrict the overall page width to 900px and center of the browser. It's a division so we have to use the symbol "#" before the code in the CSS style sheet. In addition, always remember "margins" will include the spacing outside the box and "paddings" will include the spacing inside the box. margin:0 auto 0 auto; - margin-right/left is set to auto meaning the content will always be centered inside the browser. Step 12 : Next, we set the height of the header area to 100px and width to 875px.The actual width of the header is 900px, but here we have given spacing to the box through padding and adjusted those space in the width. All the content & images will be aligned left with float:left. line-height:16px; - To increase readability of the content, you can increase the overall line-height of text to 16px. The "clear:both" tag make sure that the footer actually is displayed below the main article; it explictly tells the browser that no floating elements are allowed on both sides of the footer. Step 14 : The hgroup tag is specified with the font type "Arial" and line height of 21px. To increase readability, you can increase the overall line-height of text to 21px. 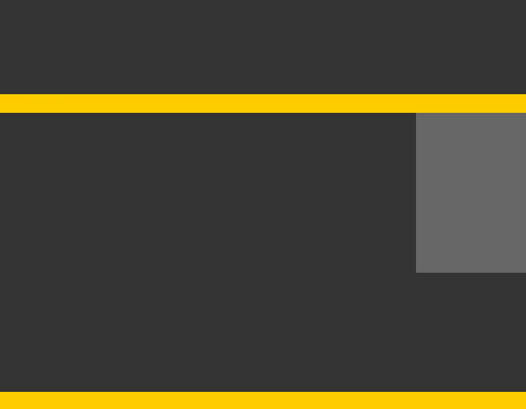 border: 1px solid #999; - Add a thin border with the color #999 to the divs. padding: 5px; - The border of the image is added with 5px padding and to move it away from the images. Step 17 : That's it! so here's what we have created the html5 page looks like now. Step 18 : Check out the demo and download here! 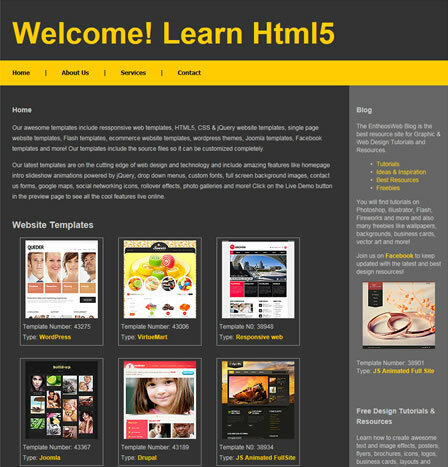 Hope you have learn how to create a simple Html5 website. Please do share your thoughts in the comments.